T he canopies of tropical forest are still among the least known natural habitats in the world. However, arboreal insect species are rarely studied due to the difficulties of accessing tree canopies. Ants represent the majority of arthropod biomass in tropical forest trees and are important to study for both ecological and taxonomical reasons. 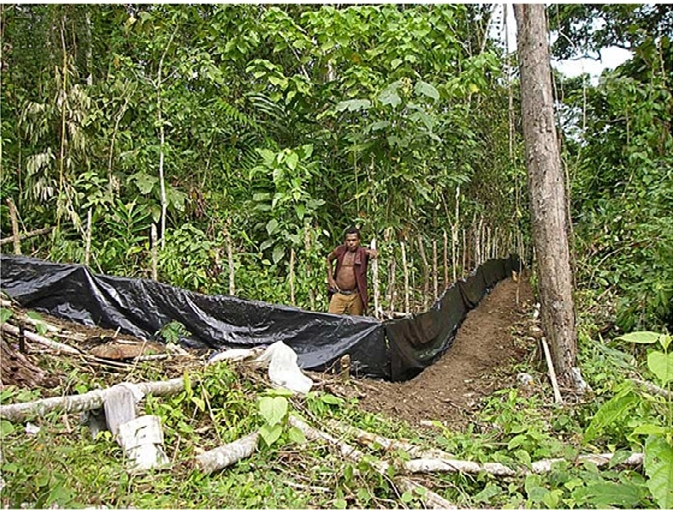 Our current projects are based on unique censuses of ant nests and foragers in felled trees in continuous rainforest plots in Papua New Guinea. We focus our efforts in three sites encompassing lowland, middle elevation and highland forest. Other methods used for sampling include single-rope technique, use of special canopy stations and baiting. The aim is to get a good estimate of the arboreal ant diversity and activity and to study their nesting ecology, interaction with scale insects (Coccoidea) and role in ant-herbivore-plant food-webs in tropical forests along altitudinal and forest successional gradients. 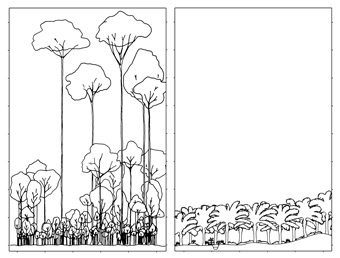 Why are there more arboreal ant species in primary than secondary tropical forests? Klimeš P, Idigel C, Rimandai M, Fayle TM, Janda M, Weiblen G & Novotny V 2012. Journal of Animal Ecology. Ants play complex ecological roles plant-insect food webs. Their impact can be best assessed by experimental manipulation of their abundance. However, ant exclusion experiments have typically only been conducted at small-scales in tropical forest vegetation, such as manipulation of specific myrmecophytic host plants and their ant partners. We created and tested a new method of ant exclusion from “whole forest patches” (25 x 25 m) and its effect on trees and their herbivores. Our initial results suggest that although it is possible to almost completely eradicate all of the ants from tree canopies, ants are not such significant predators and protectors of plants at the community level of the whole forest. Our team also works in Sabah – Borneo, where we manipulate the litter ants and termites at small spatial scale (1m2) to reveal the role of ants and termites on the soil properties and effect of ant predation on termites (Tůma et al. In Prep.). Experimental suppression of ants foraging on rainforest vegetation in New Guinea: testing methods for a whole-forest manipulation of insect communities. Klimeš, Janda, Ibalim, Kua & Novotný 2011. Ecological Entomology. Ants are generally assumed to be good indicators of habitat degradation as many invasive ant species are becoming wide-spread in disturbed habitats. We focus on the effects of forest succession on arboreal ants in Papua New Guinea, comparing the ant communities between rain forest plots in primary and secondary forests. Furthermore, we study ants living in epiphytes, in leaf litter and canopies in Borneo, demonstrating high degradation of ant communities due to forest fragmentation and oil palm expansion. Ant mosaics occur in SE Asian oil palm plantation but not rain forest and are influenced by the presence of nest-sites and non-native species. Fayle, Turner & Foster 2013. Ecography. A positive relationship between ant biodiversity (Hymenoptera: Formicidae) and rate of scavenger-mediated nutrient redistribution along a disturbance gradient in a south-east Asian rain forest. Fayle et al 2011. Myrmecological News. Oil palm expansion into rain forest greatly reduces ant biodiversity in canopy, epiphytes and leaf litter. Fayle, Turner, Snaddon, Chey, Chung, Eglgleton & Foster 2010. Basic and Applied Ecology. The group is looking at the patterns of radiation and colonization routes across archipelagos in some ecologically important ant lineages. By using the state-of-the-art molecular methods, we aim to reconstruct the evolutionary history of ants to better understand the origin and maintenance of insect diversity in the Indo-Pacific region. Because of the rather dynamic geological history in this part of the world, including the collision of tectonic plates giving origin to a number of islands and the tropical location of these particular habitats, the South Pacific is considered one of the most important hotspots for biodiversity in the world. 1. The reconstruction of species-level phylogenies and historical biogeography. We use standard ant molecular markers, including up to 7 nuclear and mitochondrial gene sequences, as well as parsimony- and model-based phylogenetic methods to infer the evolutionary relationships among species. We also estimate times of origin and diversification by using fossil information and secondary calibration points. 2. Population-level studies are conducted using traditional population genetics methods as well as gene sequences and universal microsatellite markers developed by us using published ant EST libraries. Moreover, a large amount of informative polymorphisms (SNPs) required for finer genealogy reconstructions is being generated through Next Generation Sequencing methods, e.g. double digest RADtags and EPIC markers. Janda M., Matos Maravi P., Borovanská M., Zima J., Youngerman E., Pierce N.E. (2016) Phylogeny and population genetic structure of ant genus Acropyga (Hymenoptera: Formicidae) in Papua New Guinea. Invertebrate Systematics 30: 28-40. We are also interested in the evolution and ecology of ant-plant interactions. In Malaysia we are investigating the mutualism between epiphytic bird’s nest ferns (Asplenium spp.) and the ants that inhabit them, and also the effects of habitat degradation on this mutualism. We have also worked on the relationship between Camponotus ants and their rattan hosts. In current, we are investigating the mutualistic networks, their stability and drivers between Crematogaster ants and Macaranga trees along a forest deggradation gradient in Sabah. In Papua New Guinea Nichola et al. is investigating the effects of altitude on the interaction between an exceptionally diverse and abundant community of terrestrial ant plants and their ant inhabitants. Public goods, public services, and by-product mutualism in an ant-fern symbiosis. Fayle, Edwards, Turner, Dumbrell, Eggleton & Foster 2012. Oikos. Can the failure to punish promote cheating in mutualism? Edwards, Ansell, Woodcock, Fayle, Chey & Haymer 2010. Oikos. The website dedicated to providing information about the systematics and ecology of the New Guinean ant fauna is available on www.newguineants.org. Our long-term aim is to facilitate access to photographs of specimens, their nests and habitats and provide resources for better knowledge of Melanesian ants with main focus on New Guinea island. We also share our material with international museums and taxonomists for identifications and possible descriptions of news species of social insects, notably ants and their nest symbionts. Examples of collaborative institutions are: Museum of Comparative Zoology Harvard, Australian National Collections, National Agriculture Reasearch Institute of Papua New Guinea, Natural History Museum London. For instance, from forests of New Guinea we have described 5 new species of ants and one new genus of symbiotic beetle. The Ants of New Guinea: species checklist and database of melanesian ant fauna. Janda, Kotrla, Borowiec, Klimeš & Alpert 2011. http://www.newguineants.org. Klimes P, McArthur A (2014) Diversity and ecology of arboricolous ant communities of Camponotus (Hymenoptera: Formicidae) in a New Guinea rainforest with descriptions of four new species. Myrmecological News 20: 141-158. Hlaváč P., Janda M., (2009) New genus of Lomechusini (Coleoptera: Staphylinidae, Aleocharinae) from Papua New Guinea associated with Leptogenys Roger. Zootaxa 2062: 57-64.